This is my favorite Valentine's Day card from last year's V-Day workshop. The stampsets and inks are now retired, but still it may inspire new creations for you. In addition, the big floral heart in the Always stampset can be substitued here and other designer series paper used as well. Stamp "Happy Valentine's Day" or desired greeting on large white cardstock piece. Use Versa Mark on the Floral background stamp and stamp the larger piece of white cardstock. Then cover with Clear Embossing Powder and heat. 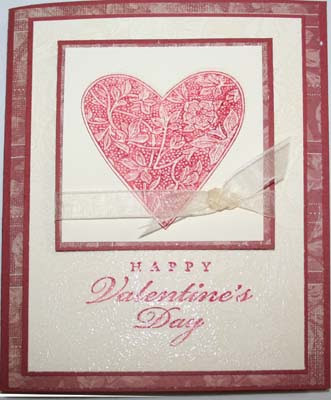 Using the heart shape, ink in Cranberry Crisp and stamp on the smaller piece of white cardstock. Then clean the stamp! Then ink it with Versa Mark pad and stamp again on the heart you just stamped. Cover with Clear Embossing Powder and heat. Layer pieces, add ribbon, and glue together.